3M's FLITE COV is a positive pressure Supplied Air Respirator that also provides emergency respiratory protection and escape capability allowing the user to enter hazardous atmospheres including those identified as immediately dangerous to life or health (IDLH). In the event of an interruption of air flow from the primary supply source switchover to emergency cylinder air supply is immediately activated by the automatic change over valve to facilitate safe egress. Warning whistle informs user switch has been made to cylinder air. Combined cylinder and pressure reducing valve features a locking hand wheel that remains locked in the open position against inadvertent shutting and a pressure gauge. Compressed air steel cylinders are provided in 10 and 15 minute durations with a 10 minute superlight carbon composite version also offered. Airline breathing apparatus comprising Tempest automatic positive pressure demand valve, change over valve, supply hose and pigtail with CEN coupling, bandolier harness and facility to connect escape cylinder. Airline breathing apparatus comprising Tempest automatic positive pressure demand valve, change over valve, supply hose and pigtail with Foster/ Hansen Mil spec male coupling, bandolier harness and facility to connect escape cylinder. 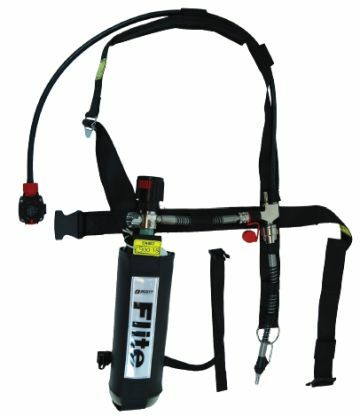 Airline breathing apparatus comprising Tempest automatic positive pressure demand valve, change over valve, supply hose and pigtail with Hansen HK spec male coupling, bandolier harness and facility to connect escape cylinder. Airline breathing apparatus comprising Tempest automatic positive pressure demand valve, change over valve, supply hose and pigtail with Staubli spec male coupling, bandolier harness and facility to connect escape cylinder. 2031604 2031604 Spare cylinder pouch for CYL-FLITE-15.